"AMBCR rescuers are experienced with high drive dogs and most of us participate in a performance sport with our own dogs. 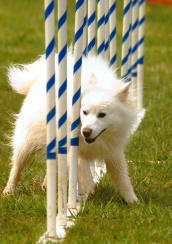 Many of our rescues are adopted to performance homes. If you are seeking a dog for obedience, freestyle, dog agility, flyball, tracking or herding, you may wish to consider one of the performance dog prospects currently in our foster care." 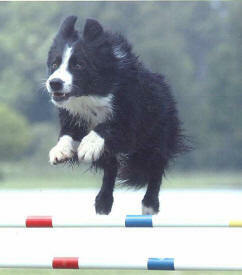 Below are photos of dogs who excel in performance sports. Some of these dogs are owned, trained and handled by an AMBCR rescuer. Others are some of our greatest adoption success stories. As you can see, some of these dogs are not Border Collies but all have the intense drive and energy level that require a high level training program and a "career" in a performance activity. of Virginia Open Ranch dogs in USBCHA trials. Heather (left and above) was rescued and fostered by Myra Soden. She has earned several herding titles in AHBA and is in the Top Ten of Virginia Pro-Novice dogs in USBCHA trials, with her owner Deb of Berryville, Virginia. Chase AX AXJ MAD GM SM EAC EJC EGC (left) is a high drive very INTENSE Border Collie. 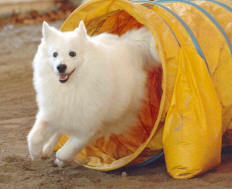 He competes in dog agility competition in USDAA and AKC. 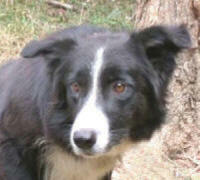 Chase is owned and trained by AMBCR rescuer, Terry Woods. 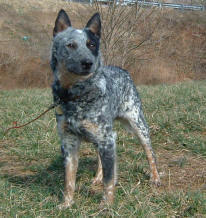 Stony is a young Australian Cattle Dog, rescued and fostered by Myra Soden. 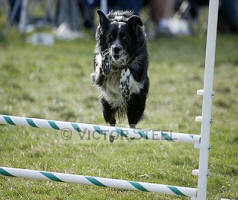 She is currently earning agility titles with her adopted owner, Barbara, of Pennsylvania. Stony is headed for the World Team! Mick (right) is an Australian Cattle Dog rescued from death row in a shelter. Mick is in training for agility with his adopted owner, Christine of Richmond, VA.
Isis, aka Izzy (left), is a whippet mix, saved from death row at a shelter by Myra Soden. 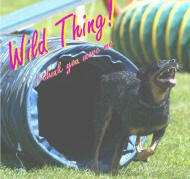 She is a competitive Frisbee dog with her adoptive owner, Vic, of Florida.